OASE AquaMax Eco Premium & Twin are reliable, energy efficient pumps for pond filter systems and streams. The OASE AquaMax Eco pumps are perfect for supplying water to pond filters, or for circulation of water down waterfalls and streams. These cutting edge pond pumps feature low energy ‘Eco’ motors designed for maximum performance with minimal power use, making these pumps the perfect choice in continuous operation scenarios such as fish pond filtration where the pump must be allowed to run all of the time. These can be electronically controlled via an optional FM Master Controller, or via the supplied remote control in the case of the AquaMax Eco Twin pumps. A second point of suction can also be added to the inlet for connection of an optional surface skimmer or satellite strainer. All AquaMax Eco Premium pumps carry an extended OASE Guarantee. 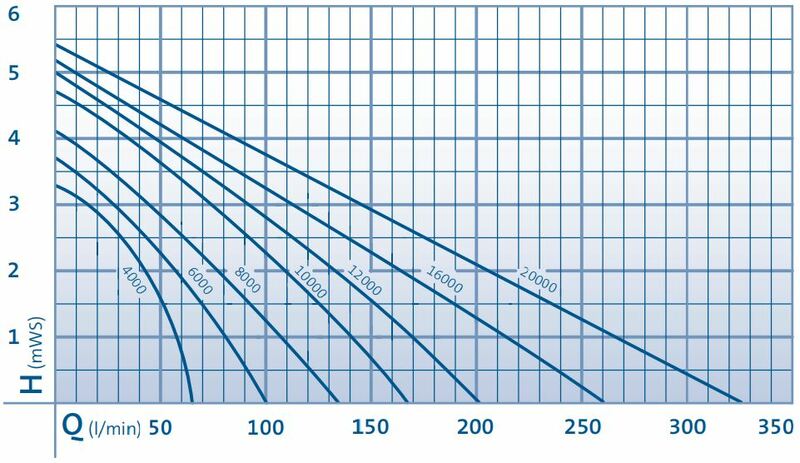 OASE AquaMax Eco Premium pumps offer flow rates ranging between 4,000 and 19,500 litres, across 7 different pump models to cover a range of pumping requirements. AquaMax Eco Twin pumps are especially suited to higher flow pumping applications between 20,000 and 27,000 litres per hour. AquaMax Eco Premium 12 Volt Pumps 6000 and 12000 are built specifically for natural swimming ponds where low voltage is a requirement for safety. 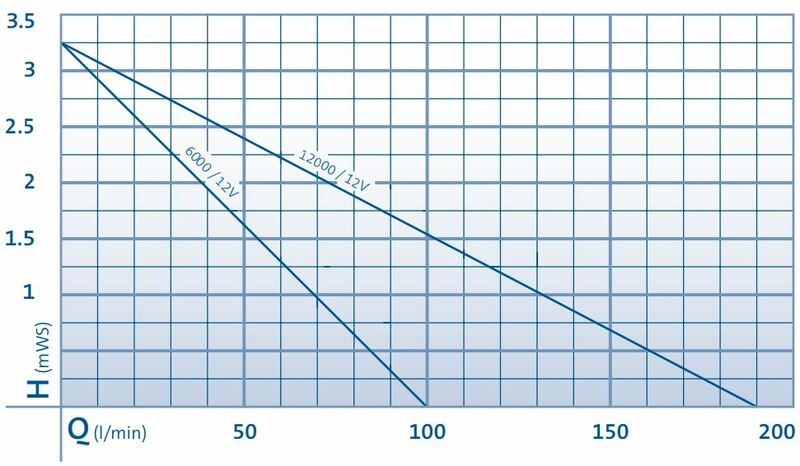 OASE AquaMax Eco Premium pumps offer high performance and outstanding energy efficiency, making these pumps ideal for continuous operation. AquaMax Eco Premium pumps are perfect for the supply of water to filter systems on fish ponds, and also for circulation of water down streams and watercourses. There are 7 standard models, with flow rates ranging between 4,000 and 20,000 litres per hour. 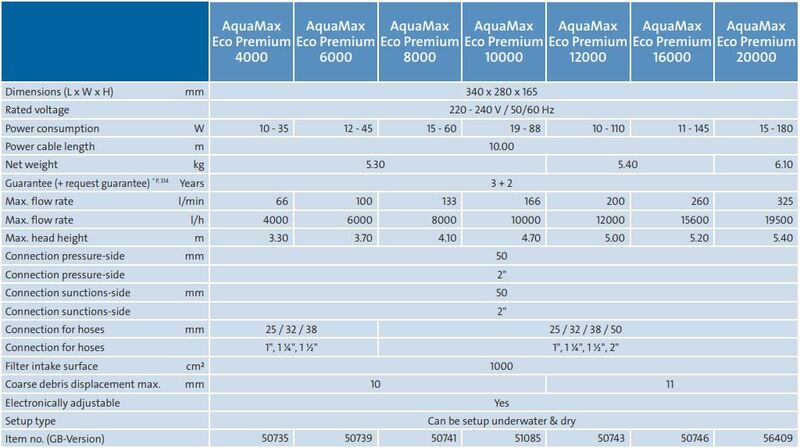 AquaMax Eco Premium pumps have a large outer surface area and can handle 10-11mm particles. Environmental Function Control protects the pump from dry-running. 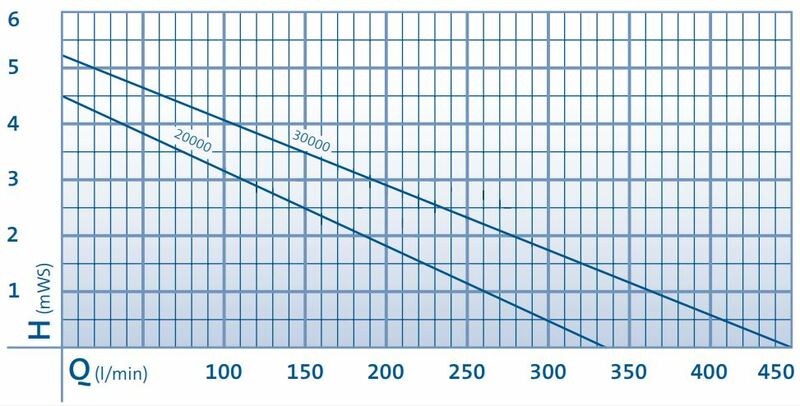 Seasonal Flow Control (models 12000-16000-20000) enables the option of automatic reduction in power over Winter. The secondary suction inlet (all models) enables a second suction device (skimmer or satellite filter) to be connected and run alongside the primary pond floor suction. These pumps are supplied with a 10 metre power cable and carry extended OASE guarantees. OASE AquaMax Eco Premium 12 Volt pumps are a low voltage alternative to the standard AquaMax Eco Premium pumps. These efficient, low voltage pumping units follow the same physical design as the standard AquaMax Eco Premium pump version, but are safe for circulation of swimming ponds, where mains voltage is to be avoided. 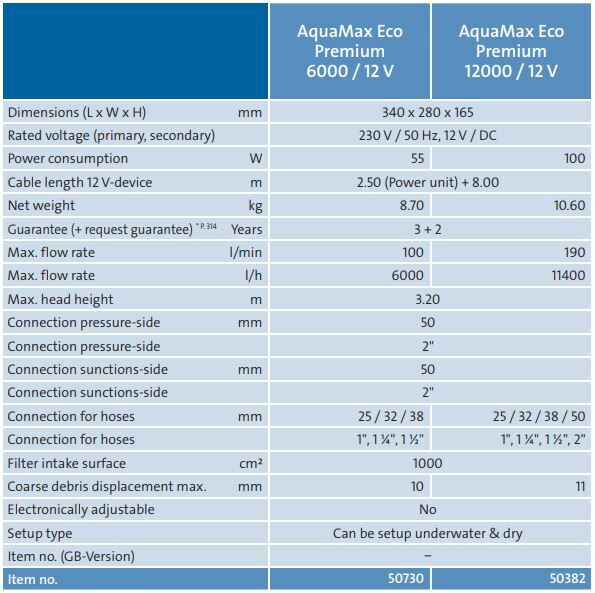 There are 2 models of AquaMax Eco Premium 12 Volt pump available; a 6,000 litre per hour model, and a more powerful 12,000 litre per hour pump. The 12 Volt pumps feature the same SFC dry run protection and secondary suction facility as the standard versions do. AquaMax Eco Premium 12 Volt pumps are powered via a weatherproof transformer with a 2.5 metre mains cable and an 8 metre low voltage cable. These pumps can be submerged underwater or installed dry below water surface level. 3 + 2 year OASE extended guarantee on both 12 Volt pump models. OASE AquaMax Eco Twin pumps are large, high flow, submersible pumping units for pond filters and streams. AquaMax Eco Twin Pumps combine the output of 2 AquaMax Eco Premium Pumps into a single more powerful pumping system. 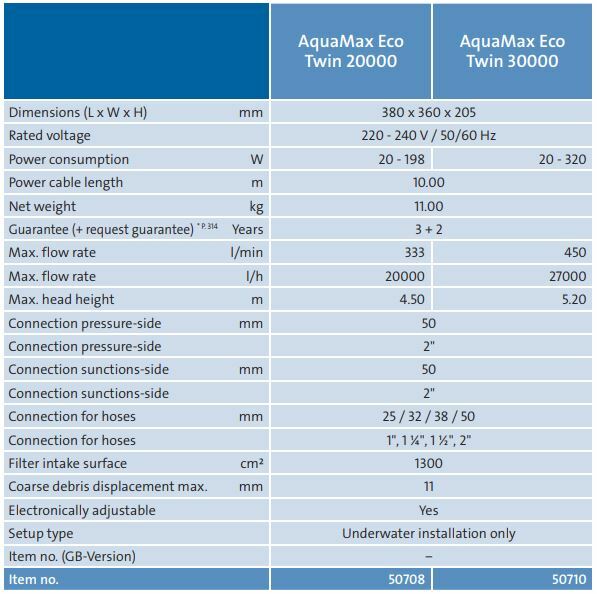 There are 2 AquaMax Eco Twin pumps available, outputting 20,000 and 30,000 litre per hour respectively. AquaMax Eco Twin pumps are supplied with an inline, stake-mounted FM receiver and a key-fob remote control. The remote control can be used to switch the 2 motors on and off individually, and to regulate flow output of each motor and thus the overall flow rate from the unit. A digital display on the receiver shows the set incremental flow amount. 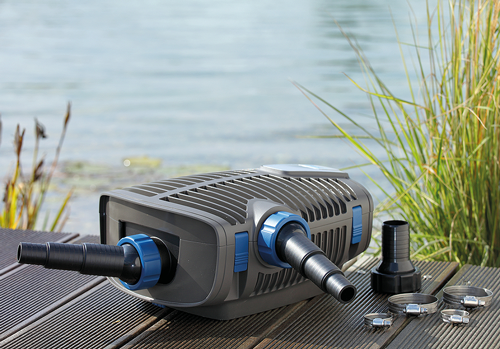 The AquaMax Eco Twin pumps have a secondary suction inlet for connecting a skimmer or satellite strainer. These pumps are supplied with 10 metres of cable between the pump and the receiver, and an additional 1 metre of cable for connecting the receiver to a power supply. SFC dry-run protection integrated and OASE Extended Guarantee on both pump models.